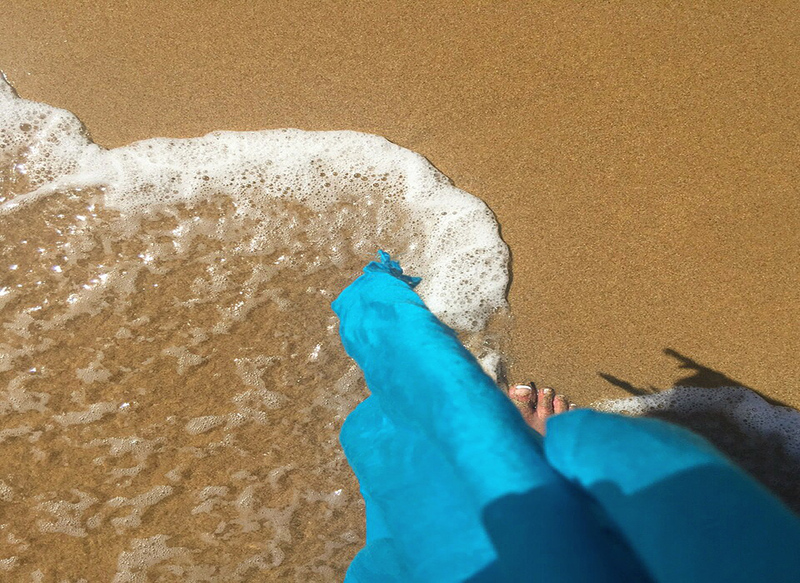 The first beach we found was Praia de Furnas which actually turned out to be our favourite! A small dramatic cove which is found at the end of a very bumpy narrow track off of the main road! 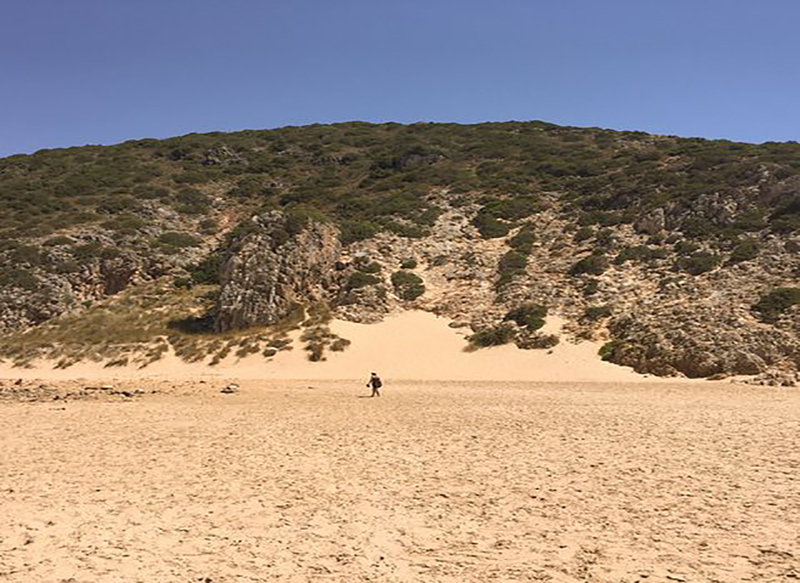 There is nothing actually there in terms of a snack bar and/or facilities – which might not work for everyone – but was a bonus for us as it meant fewer people and a totally natural and unspoilt spot! 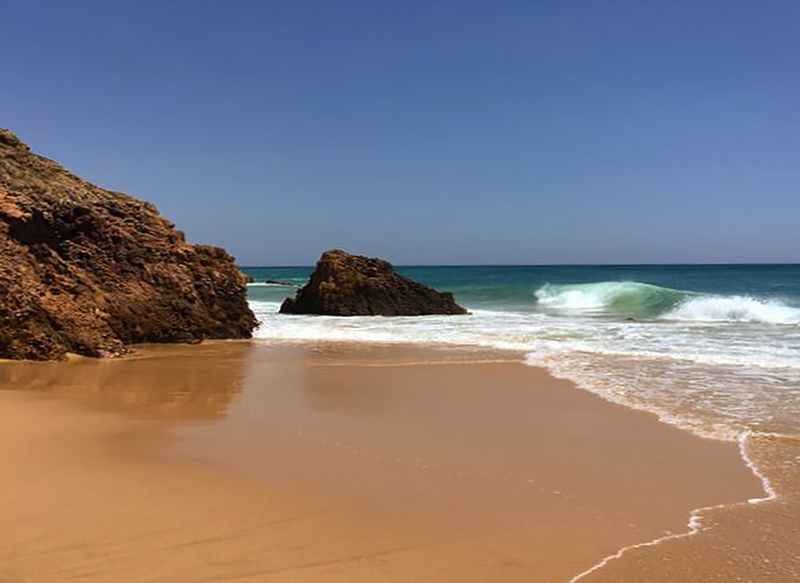 It was very relaxing and tranquil too with the high rising terrain forming an intimate cove and cocoon around us which was wild and green … we still can’t get over the crystal clear waves and that pristine sand !? 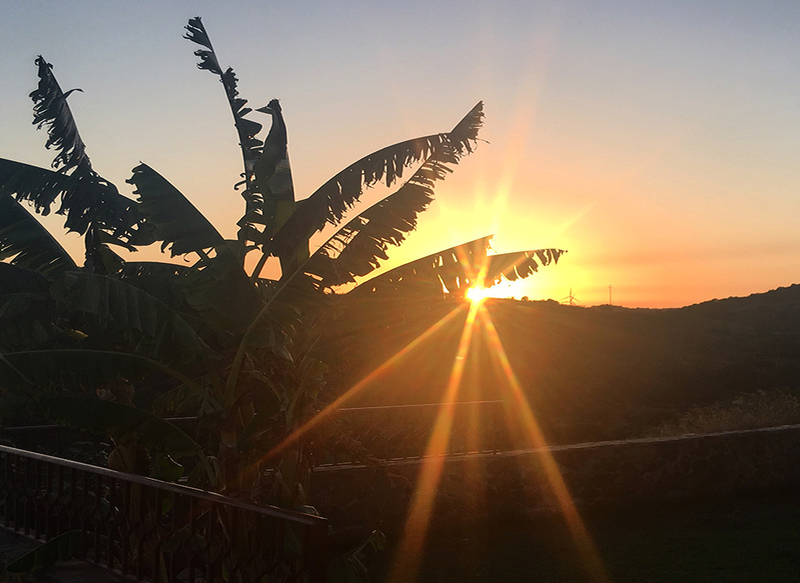 Praia de Luz, on the other hand, was the complete opposite as it is a long, well set up, sprawling beach – but just as striking and beautiful! 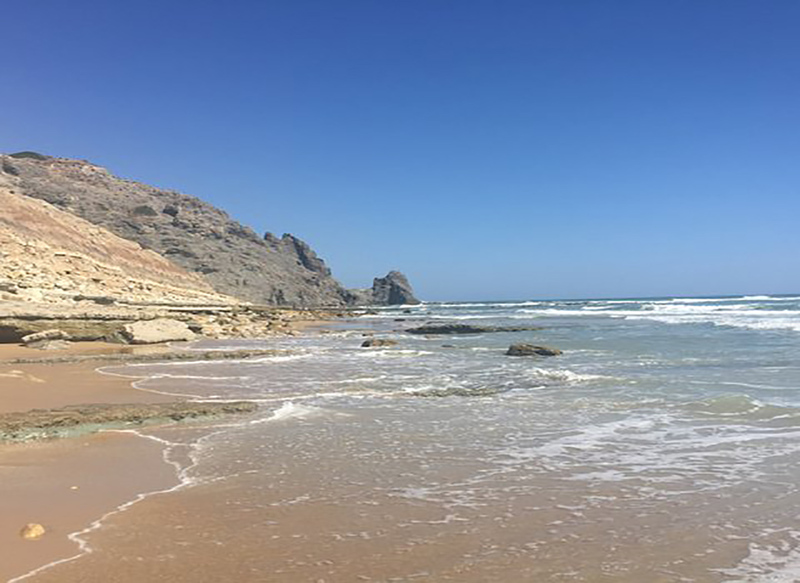 With a high, imposing coastline of rock formations into the sea at one end and in contrast, at the other, private beach arrangements with beds, umbrellas, cafes, restaurants, changing rooms, showers and shops! 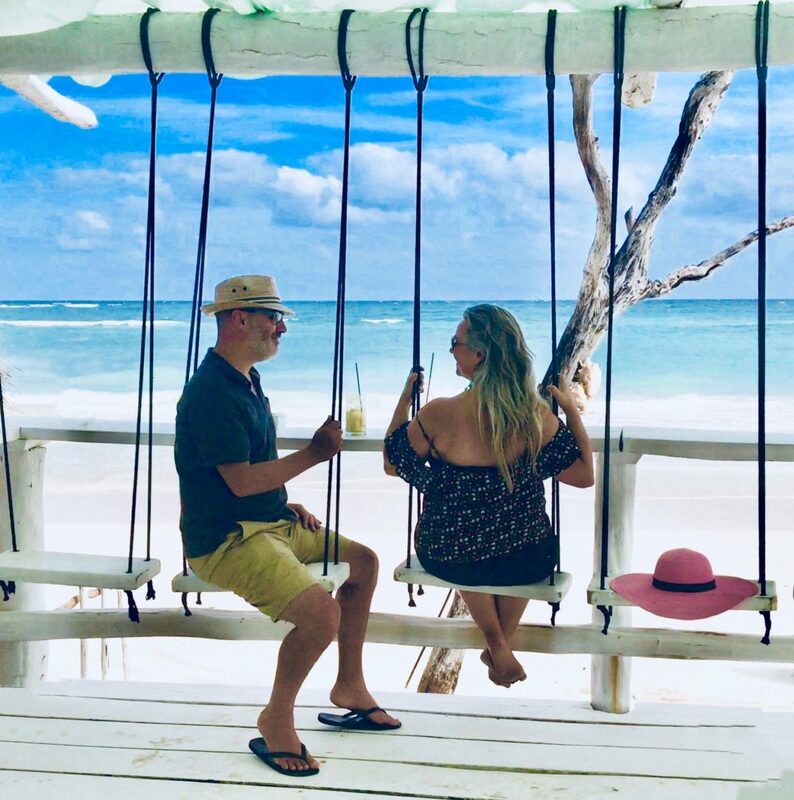 A busier beach yes – with the parking being a slight issue – but great fun again in the wonderful waves surrounded by real cafe culture, people watching and plenty going on all around! 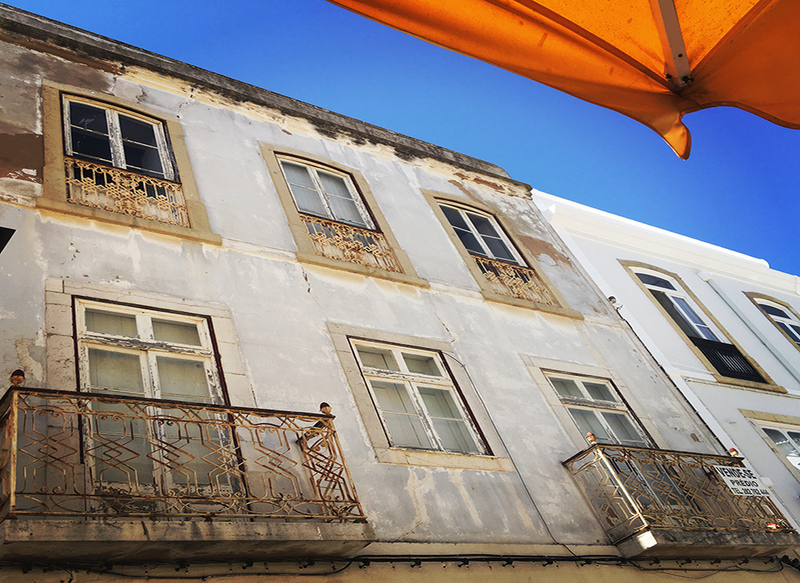 A walk around the lovely town of Lagos was then very welcome to get some shade – and/or more importantly a delicious lunch! 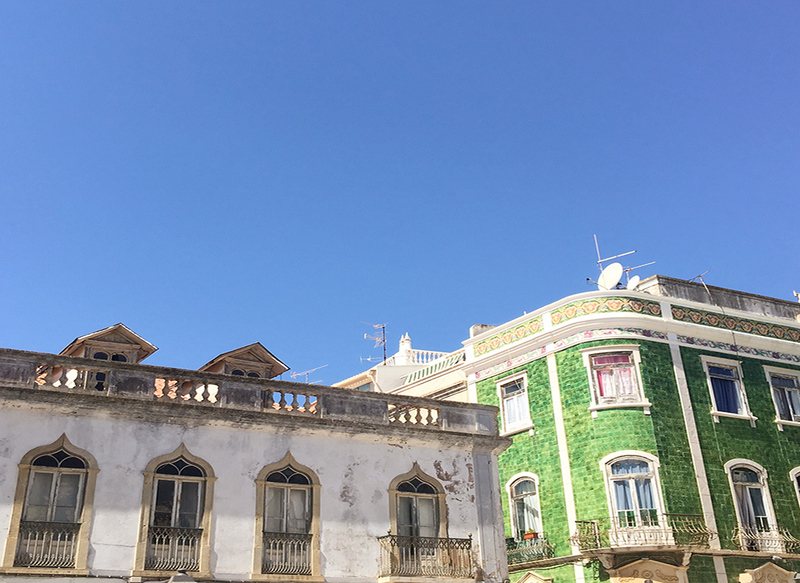 And was a delight as the traditional architecture and colourful tiled facades were shimmering in the sunlight – set off by the clearest of blue skies! Obviously fresh fish was the order of the day, in particular lots of charcoal grilled sardines which were to die for! 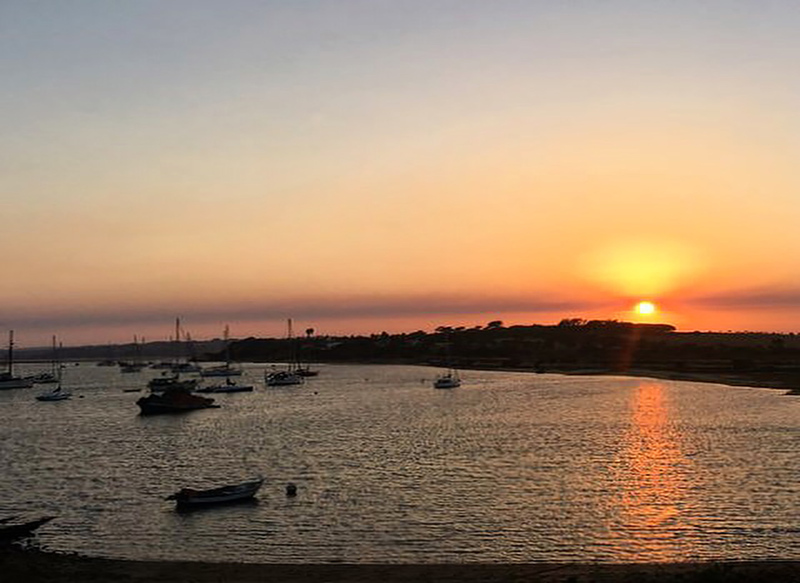 Of an evening we would recommend Alvor a small but lively place set on the waterfront. 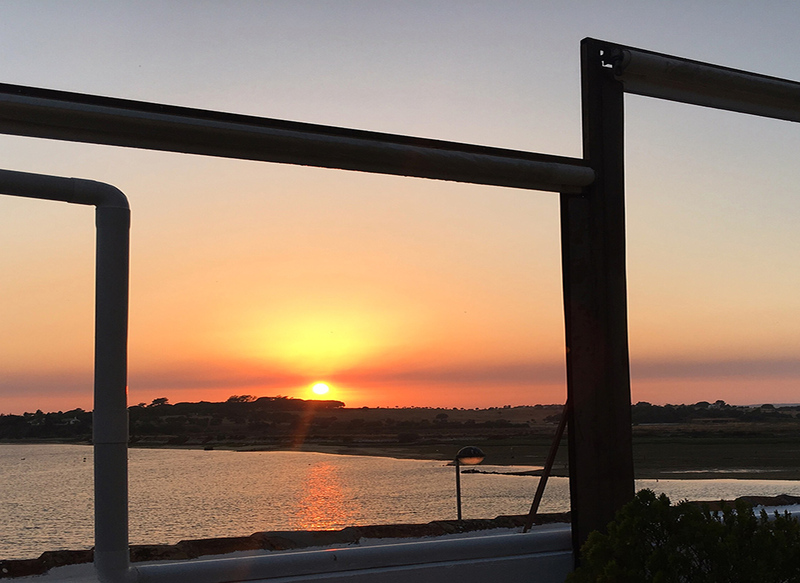 With a labyrinth of bars and restaurants there is plenty of atmosphere … and with most dining tables pointing out to sea, over looking the small harbour and beyond, there is no better place to enjoy the guaranteed spectacular sunsets and dreamy skies! 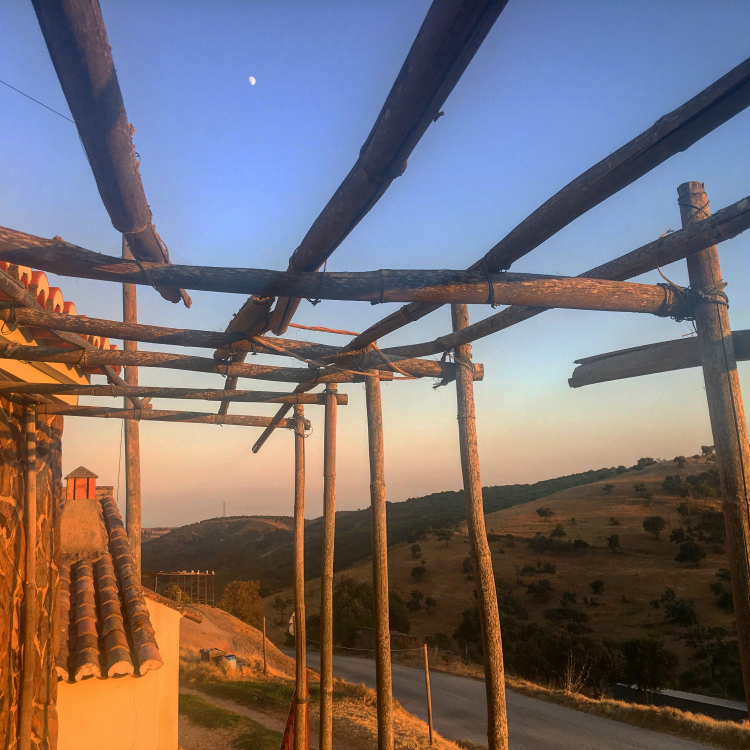 On our last night though we chose to have a more chilled evening away from the busier tourist eateries and drove about half an hour in land, up into the hills, for a traditional meal in the town of Pincho. Here they serve the famously delicious Piri Piri chicken and heaps of huge fresh juicy prawns in garlic! Eating al fresco is always a joy! 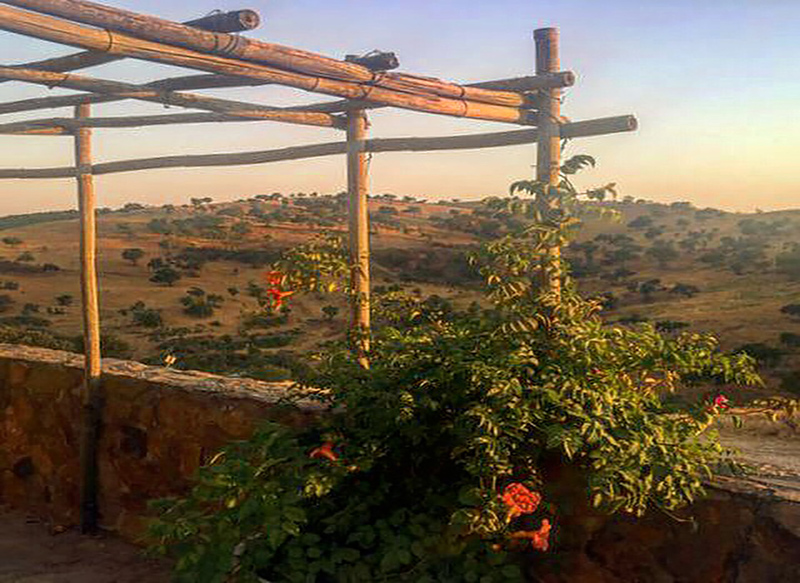 On this occasion with the beautiful, unspoilt views from the restaurant’s veranda … in the warm evening glow of the sun, slowly setting … it really couldn’t have been a more idyllic end to our perfect Portuguese weekend!